Coming up exhibition “Salon d’automne” in the Champs Elysées – Talva Design Talva D.
11 years ago I have experienced maternity for the first time, and it influenced my vision on the world… As a creator, I have worked on the subject and exhibited a series of drawing in a gallery in Paris, an armchair sculpture in the biennale of design in St Etienne, textile and wall decoration limited series that were edited, an installation in the Madeleine church in Paris… BUT I still had the desire to interpret my very initial series of drawings into stain glass. I was lucky enough to meet Catherine Aoustin, a wonderful person and craftswomen with which I have been collaborating since a year and a half. Catherine shares with me not only the wish to re-bring to life these drawings, but also my reflection regarding maintaining craftsmanship in today art and design world. Together we pushed the stain glass technique into a 3 dimensional art in relief and sculpture. In our first artwork “Mother -Women”, the mother in the stain glass panel is incarnated in relief and continues the movement of liberation as a sculpture. 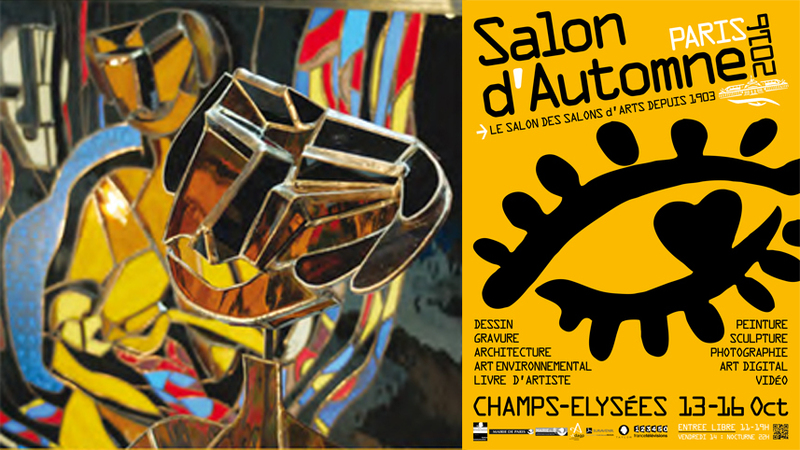 I’m very proud to invite you to the first exhibition of this project in the champs Elysées, as part of the historical art exposition, “salon d’automne”, between the 13 and 16 of October. We hope it will mark the beginning of this fruitful collaboration and will help the continuation of our research!